On November 14, 2016, Georgetown’s Foreign Service School, its Center for Contemporary Arab Studies (CCAS), and its Middle East-North Africa (MENA) Forum showed the Netflix propaganda film “The White Helmets”. Following the film (which the Helmets had shot), there was an extremely biased panel discussion about current Syrian events. 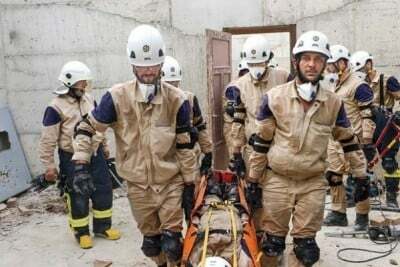 The motion picture, well-received by the audience, offered a carefully-edited account of the White Helmets, an alleged civil defense and rescue group. No member had any kind of background involving rescue work. Indeed, they all seemed to be either butchers, bakers, or candlestick makers. One alleged he had been a terrorist but had reformed and now wanted to help his fellow countrymen. The film depicted the White Helmets rescuing infants at great risk while under fire from the Syrian government and Russia. The only training they received was in Turkey, coming from classes and drills which the Anatolian government provided. Marwa Daoudy. Assistant Professor at CCAS and the School of Foreign Service. Previously she had had ties to Harvard and Princeton Universities and the US government-connected Middle East Institute. She is deeply involved in work on national security and Middle East politics. Rafif Jouejati. A “management consultant”, she joined the “Syrian revolution for democracy, dignity, and freedom in March 2011”. Jouejati had been a spokesman for the formal Syrian opposition coalition during the 2014 Geneva peace talks. She is also a director of FREE-Syria. Kenan Rahmani. Policy Advisor at the Syria Campaign. A Syrian-American activist, he spends time in north Syria working with civil society groups, including the White Helmets. After the film, Raed al-Saleh, refused entry to the US in April 2016, and Rafif Jouejati, expanded on the US government’s deceits about Syria’s legitimate government, Russia, and Iran. Ably assisted by Kenan Rahmani and Prof. Marwa Daoudy at CCAS, the group promoted the most outrageous falsehoods about US efforts to overthrow Syria’s regime. They also refused to accept the results of November 8’s US general election and urged the students to protest a suddenly racist and hate-filled America. Cheered on by at least 200 impressionable students, the group arrogantly and openly lied about events in Syria, asserting that that country’s government and Russia were bombing schools and hospitals. The panel members claimed that Bashar al-Assad had used chlorine and other poisonous gases in attacks on Syrian “freedom fighters”. Jouejati alleged that she and her groups believed in non-violence and that the Syrian government had forced the closure of most of their offices. She insisted their members had been targeted for retaliation, while Rahmani said that the Syrians themselves should decide their own future. Daoudy asserted that the US election had shocked the Syrians Rahmani, in a remarkable statement, charged that Islamists were happy the US elected Trump, thus proving democracy doesn’t work. He also declared that the Russians, Trump’s allies, have killed more civilians than ISIS. Continuing, he averred that Trump opposed all people of color, Jews, essentially, anyone different from him. Jouejati went on to say that Assad must go and that the choice is not him or the extremists. Al-Saleh not only attacked Russia and Assad but also Hezbollah and Iran for helping prop up the Syrian government. He avowed that Idlib, where he was from, was a multi-religious, multi-ethnic community. In response to the author’s one question about the White Helmets’ questionable connections: to British intelligence, to NATO, to the US Agency for International Development, and Jabhat al-Nusra, al-Saleh launched an ad hominem attack. Ignoring the author’s references to Vanessa Beeley’s and Max Blumenthal’s analyses, al-Saleh denied his removal from the US, his group’s cache of weapons, and his ties to terrorism. The audience cheered. The author had no chance to respond. CCAS allowed only two other, extremely mundane questions. They included praise for the “heroic” White Helmets. In keeping with the propaganda aspect of the operation, a woman came up to the author afterwards with a remarkable story. In it, she noted that she had been blocked from distributing a flyer referring to the White Helmets’ questionable nature. Her offense? The paper listed titles and authors of news articles about the Helmets’ hoax. One described the White Helmets as “al-Qaeda with a face-lift”. Oh, yes, to facilitate the White Helmets “helping the Syrians”, they receive millions of dollars in government funding. It comes from the United States, Great Britain, Germany, and France. The White Helmets operate only in areas controlled by terrorist groups such as Jabhat al-Nusra. Naturally, not one word came from the panel about the White Helmets’ origins. Scott Ritter, former weapons inspector in Iraq, did shine some light on their murky beginnings. He said: “The organizational underpinnings of the White Helmets can be sourced to a March 2013 meeting in Istanbul between a retired British military officer, James Le Mesurier—who had experience in the murky world of private security companies and the shadowy confluence between national security and intelligence operations and international organizations—and representatives of the Syrian National Council (SNC) and the Qatari Red Crescent Society.” Le Mesurier had also operated in Iraq and Yugoslavia. Furthermore, our source noted that while she was in the country, the Yugoslav white helmets always seemed to be tied to CIA operational areas. They also stirred up conflicts in locations supposedly being pacified, she said. Calling them “very empowered criminals”, our contact added that they always enjoyed a rank far above the UN officials and other aid workers. It’s one thing for Georgetown University officials to foist this off on their students as Syrian current events. It’s another for the students to sit there and swallow it. A former professor at Georgetown clarifies this. Nicholas Greenwood Onuf once said that Georgetown. a Catholic Cow College [down-market school], has students that can’t or won’t think.